Bridle Trails is the neighborhood surrounding Bridle Trails State Park, a nearly 500-acre forested area with trails and arenas for events and horse shows. Naturally, many residents of Bridle Trails prefer room for their horses, therefore most of the homes for sale are large, custom built luxury estates on acreage, but the neighborhood also consists of townhouses and condos for sale, as well. Bridle Trails is centrally located between Lake Sammamish and Lake Washington and the cities of Bellevue, Kirkland, and Redmond. 4 Beds | 2.75 Baths | 3244 sq. Ft.
3 Beds | 2.5 Baths | 1684 sq. Ft.
5 Beds | 6.75 Baths | 9985 sq. Ft.
4 Beds | 2.25 Baths | 3290 sq. Ft.
4 Beds | 3.75 Baths | 3610 sq. Ft.
4 Beds | 2.75 Baths | 3320 sq. Ft.
3 Beds | 1.75 Baths | 1659 sq. Ft.
4 Beds | 3.5 Baths | 4160 sq. Ft.
4 Beds | 3.25 Baths | 4111 sq. Ft.
2 Beds | 1.5 Baths | 1048 sq. Ft.
4 Beds | 2.5 Baths | 4130 sq. Ft.
5 Beds | 5 Baths | 6227 sq. Ft.
4 Beds | 5 Baths | 9262 sq. Ft.
4 Beds | 3.75 Baths | 4500 sq. Ft.
Blue Summit Realty has the most accurate and up to date Bridle Trails real estate listings on the web. Currently there are 18 homes for sale, 5 condos for sale, in Bridle Trails. Of the 23 total Bridle Trails residential listings for sale 0 are bank owned, 0 are short sales, 0 are new construction, and 0 are townhomes. The price ranges from $469,000 to $0 with a median list price of $1,949,322 and median sold price of $838,934. Make sure to refine your Bridle Trails real estate search by property type, price, square footage, bedrooms, bathrooms and more with the search tool above or view the Bridle Trails listings on our interactive map. 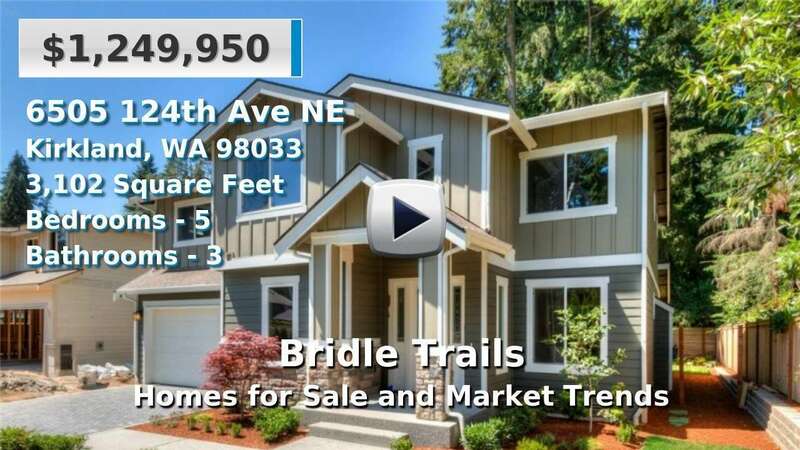 Our Bridle Trails real estate listings were updated 8 minutes ago.